Don't miss out on the Emerald Spire Superdungeon Multi-Pack to get all the maps you need to run this deadly dungeon, and the Emerald Spire Superdungeon Campaign Cards for quick reference to quests, NPCs, and notable items! The Emerald Spire is sanctioned for use in Pathfinder Society Organized Play. Its Chronicle Sheet and additional rules for running this module are a free download (859 KB zip/PDF). We just finished this adventure, and what a ride. It is quite difficult, we lost a ton of characters, but almost everything felt fair. Some levels are really mean, and it will frustrate players no doubt, but if they want to be challenged, and you like playing to the will of the dice gods, they will have a blast. I was going to give a rundown of the levels, but I feel it would had too many spoilers and I liked the feeling of surprise that we had with every new step we took towards the bottom. Number of Sessions; 26 over 1 year 1 month. I Completely recommend this adventure. Is not just a Superdungeon, it's an amazing story to be retold over and over. I had blast playing this for PFS. We finally finished it. Some levels are crazy hard if the DM runs it correctly. You could be fighting 2-3 encounters at once. We had a couple players refuse to come back and play. They couldn't handle the pressure. Another player packed his stuff up like every other session crying for mommy :). We made our diplomacy rolls and so he stayed. I played a paladin. I loved it. Talk about being heroic. I probably saved a dozen player deaths during the sessions with paladins sacrifice. I would make sure you have some strong players and a well-built group. I would say you need a tank, healer, and rogue. Don't be afraid to max the table out and enjoy the beat down. One of the most "rail-free" modules for pfs - as gm you may put amazing roleplay opportunities there - there are enough backstory for npc`s (town and dungeon alike) to make them alive and have motivation. Combats are neat, exploration are neat, layouts are neat. My favorite module. A huge dungeon crawl with minimum roleplay. I can't say the fights are easy... however most PFS gruops of The Emerald Spire are power gamers that put all source on combat. Just not challenging enough. If you prefer roleplay or investigaion, skip this. It's made for buttkickers that want to build high-level PFS characters(with more gear than average). I would not recommend this, but for who enjoy "draw a dungeon, than kill them all, get the treasure", that's what you're looking for. I am running it for a group of players and everyone is having a blast. This module could have definitely been a five star rating if it weren't for all the errors such as wrong monster stats and conflicting tactics. It's presently estimated for Kickstarter backers in June 2014, so sometime after that. Can't wait to see it! (I hope it comes out before 2014 but...I will wait! :) ). Cover image is a mockup and subject to change. do you know what the page count is? Does anyone know where the mock-up cover image is from? All of Paizo's adventures, with the exception of PFS scenarios, are written for the standard 4 players. That image is actually of Scarwall from Curse of the Crimson Throne. With Thornkeep, i think it was just a tad early, similar to how all their subscription products ship. SUPERDUNGEON is now stuck in my head, and all I can envision is a giant emerald crystal jutting out of the ground, adorned with a fluttering red cape. Hopefully the real cover will push that image out of my brain. Why is this considered a pathfinder module? Um... because it's a Pathfinder module? A really BIG one! I backed the PF:Online kickstarter last May at the level to get this as my reward (I don't really play video games), and I'm eagerly awaiting release! I did the same thing Haladir. 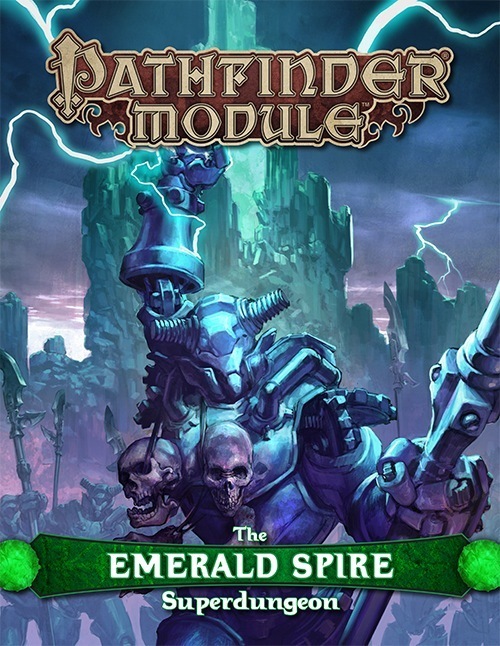 I wasn't too interested in PFO, but wanted to support the project anyways and get Emerald Spire. Totally looking forward to getting my hardcopies. I completely forgot the Michael Stackpole was working on a floor. It's been awhile since I've read something by him. Great author though. Really excited he contributed. It's been bugging me and I can't find an answer. Where in Golarion is the Emerald Spire? It's located in the River Kingdoms, I believe. That's right. If you've got the "Thornkeep" module, the map inside the front cover shows the Emerald Spire about three miles SSW of Thornkeep. I just wonder how many chambers each level has, i.e. how big the levels actually are? Small enough to fit a flip-map, or perhaps more like levels in Castle Greyhawk? Each level fits on a flip mat; same as Thornkeep's levels. I know I'm asking a lot, but any chance we'll be able to buy it at Paizocon? Yep—there will be a giant pack of Flip-Mats that match the multitude of levels. And we should have it at PaizoCon. how many pages? does sound like it will be an awesome book! Based on the size of the Thornkeep levels I'd guess at 256 pages. Hmm, I was hoping for bigger levels, but perhaps the rooms will be in general a bit smaller than in Thornkeep? Any idea as to when we may see a finalized cover as well as some interiors perhaps? I hope there are flip-mats for all the levels, as the Thornkeep maps were short one level. I’m guessing it was probably because it was only one level (and they are ‘flip’-mats), but I would been ok with just a general square grid on the other side. I'm pretty sure that was because the first layer of Thornkeep was designed to also work as a MMO dungeon, and it turns out for MMO dungeons having more space to move around is much better for gameplay. If you take a look at the first level it's huge. That would take multiple flip mats to have out at once. The book is 160 pages encompassing 16 levels—one level from each author. The Flip-Mat pack is 8 double-sided Flip-Mats, covering all 16 levels. I'd expect to see the final cover and description go up within the next month or so. Someone is going to ask this, it may as well be me: is this a subscriber module or add-on? I'm not sure how I feel about this. I liked the environs part of Thornkeep, and some of the dungeons seemed neat. But many, many people did not like the Thornkeep dungeons. It really seemed like too much was going on in too little print space, and that's a lot of the feeling I'm getting here. When will the flip mat super set be made available for pre order? Also hoping to get PDFs of all 16 maps. Assuming the maps become available for pre order, will a similar PDF deal apply? being a KS PF-OL crowdforger guild member, I will already receive a PDF of adventure and maps. Is there a way to get those at a slightly cheaper price since I'll get the PDFs ? ?